​Cruise rates changes based on day,date and length of your charter,please use calendar to see availability and pricing.You can also purchase Gift Certificates too...See below calendar. Every public sailing charter includes private use of the Sailaway Cat, Licensed Captain, fuel, waste disposal, and cleaning costs. You may always bring your own food and favorite adult beverage. 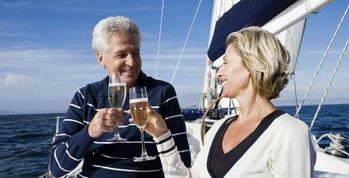 All private Bareboat charters comes with your own license Captain. We do not have a mandatory gratuity built in the prices, at the and of your trip if you are satisfied with your Captain's service please consider leaving 15 to 20% gratuity for him. Visit Sailaway Clear Lake Charters's profile on Pinterest. ​Our number one goal is to make sure your experience is a great one at Sailaway Clearlake Charters and thus offer one of the most accommodating cancellation policies in town. If you wish to cancel for whatever reason in advance of 48 hours before your charter time, you can rebook your trip for future date and time within a 30 day time frame. (Except,Saturdays, Holidays and special events like Fireworks ) ,Unfortunately we do not accept any bookings with less than a 48 hour notice, as that will not give us enough time to fill the slot with another interested party. If Sailaway has to cancel for any non-weather related reason (I.e., the boat needs maintenance), we will rebook at a date and time of your choosing or offer you a full refund. If the Captain deems the weather will not be suitable for sailing that day, we will let you know as soon as possible and give you 30days to rebook your trip.